(Trent Nelson | The Salt Lake Tribune) Bryan Kido in Bijan Hosseini's The Frailest Thing, one of four short plays by four Utah playwrights of color that make up Plan-B Theatre's Of Color, during rehearsal in Salt Lake City on Tuesday March 19, 2019. 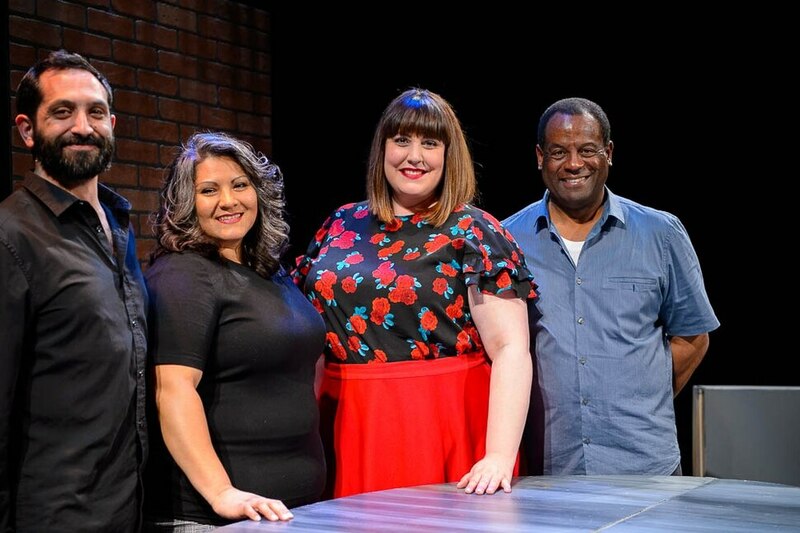 (Trent Nelson | The Salt Lake Tribune) Bijan Hosseini, Iris Salazar, Olivia Custodio, and Darryl Stamp, the four Utah playwrights of color that make up Plan-B Theatre's Of Color, photographed in Salt Lake City on Tuesday March 19, 2019. (Trent Nelson | The Salt Lake Tribune) Yolanda Stange and Carlos Nobleza Posas in Iris Salazar's American Pride, one of four short plays by four Utah playwrights of color that make up Plan-B Theatre's Of Color, during rehearsal in Salt Lake City on Tuesday March 19, 2019. 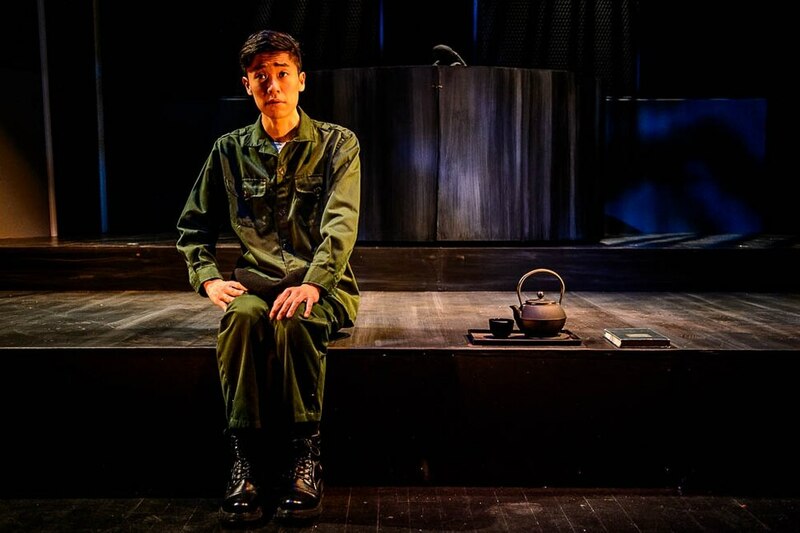 (Trent Nelson | The Salt Lake Tribune) Bryan Kido in Bijan Hosseini's The Frailest Thing, one of four short plays by four Utah playwrights of color that make up Plan-B Theatre's Of Color, during rehearsal in Salt Lake City on Tuesday March 19, 2019. 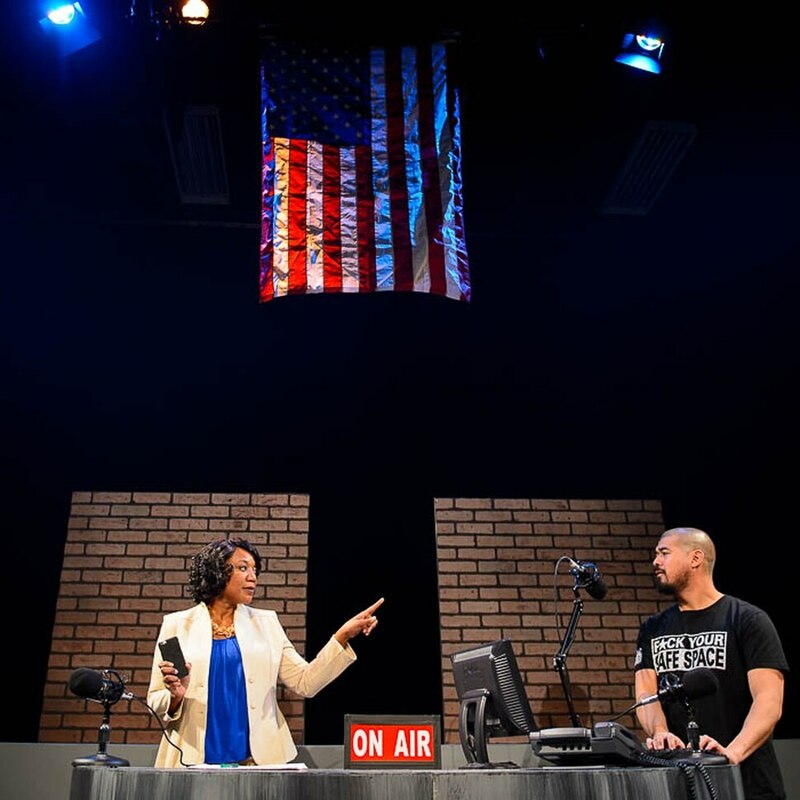 (Trent Nelson | The Salt Lake Tribune) Yolanda Stange and Carlos Nobleza Posas in Iris Salazar's American Pride, one of four short plays by four Utah playwrights of color that make up Plan-B Theatre's Of Color, during rehearsal in Salt Lake City on Tuesday March 19, 2019. (Trent Nelson | The Salt Lake Tribune) Erika Ovuoba, Yolanda Stange, and Brien Jones in Darryl Stamp's Roar, one of four short plays by four Utah playwrights of color that make up Plan-B Theatre's Of Color, during rehearsal in Salt Lake City on Tuesday March 19, 2019. (Trent Nelson | The Salt Lake Tribune) Bijan Hosseini, Iris Salazar, Olivia Custodio, and Darryl Stamp, the four Utah playwrights of color that make up Plan-B Theatre's Of Color, photographed in Salt Lake City on Tuesday March 19, 2019. (Trent Nelson | The Salt Lake Tribune) Erika Ovuoba, Jillian Joy, Carlos Nobleza Posas, and Bryan Kido in Olivia Custodio's Drivers License, Please, one of four short plays by four Utah playwrights of color that make up Plan-B Theatre's Of Color, during rehearsal in Salt Lake City on Tuesday March 19, 2019. Iris Salazar found inspiration for her play on Facebook, in the shock she felt when she saw a friend had posed with Vice President Mike Pence for a photo. Olivia Custodio’s play draws on how she was treated by a roomful of men at a car rental agency. Bijan Hosseini’s play reflects the broader world view he grew up with, with his father from Iran and his mother from Okinawa, Japan. Darryl Stamp’s play was influenced by his background in stand-up comedy. All four writers are Utahns of color who have created their first short plays, which will premiere together with Plan-B Theatre from March 28 to April 7 under the umbrella title “Of Color.” The plays grew out of Plan-B artistic director Jerry Rapier’s June 2017 invitation to artists of color to gather and talk about how to diversify Utah theater. Fifty-one artists attended the June meeting; a handful participated in a free writing workshop Rapier organized with playwright Julie Jensen. Salazar knew her friend who had posed with Pence wasn’t racist. But still, she was stunned by the image. Her play focuses on an encounter at a radio station between a racist white president on the campaign trail, a white woman who describes herself as an “educated Christian lady” and a shackled Mexican woman pleading in Spanish for the return of her children. Actors of color play the white characters; a fair-skinned woman plays the immigrant mother. The casting is an experiment “with what happens when racist characters are played by actors who look like the very people that racism is focused on,” Rapier said. Salazar’s mother was a student at Brigham Young University in Provo who went back to Mexico to give birth to her, then returned to Utah. Salazar grew up in the Sugar House and Liberty Park area, attending neighborhood schools and an all-white ward of The Church of Jesus Christ of Latter-day Saints. “My mom went from a seamstress to a cleaning lady to a school bus assistant to a housekeeper. She worked very hard and made sure we were taken care of, but we were poor, homeless at one point,” Salazar said. Discrimination rarely marked her life at school or in the ward, she said. But when she went into a 7-Eleven with a white friend, it was Salazar who was asked to empty her purse as they were leaving. Then there were the disparities she saw working for 10 years at a juvenile detention center and with youth Peer Court. Staff made racist comments; Latino kids seemed more likely to face consequences for being truant. Salazar had felt heady pride at age 21 when a federal judge swore her and others in as U.S citizens. Now she sees nationalist rhetoric and anti-immigrant policies from Donald Trump’s presidency and a rising tide of emboldened racist violence. The contrast makes her tearful. At 18, when Hosseini was pulled over by an officer in the southern end of the Salt Lake Valley, he knew what to expect. He’d been repeatedly stopped by police, always with the same claim: His car matched a stolen vehicle in the area. To Hosseini, it was a ploy to search the car of a person of color. He’d roll down the window, lock his hands on the steering wheel and then narrate to the officer each of his actions as he reached for his papers. That, the quiet-spoken Hosseini said, with anger in his voice 17 years later, is the reality of being a person of color in America. And it’s a reality that — with each police shooting, with each mass shooting by a white gunman — he believes white Americans are beginning to understand. “A mirror is a humbling thing. You have to be willing to look at it,” he said. Hosseini’s Iranian father and Japanese mother met at a bar in Ogden. Hosseini grew up in Sandy, where he said neighborhood children wouldn’t play with him because, as the child of atheists, he didn’t believe in God. Hosseini was raised with an understanding of U.S. foreign policy and its covert activities in oil-rich countries, such as the CIA’s role in the 1953 overthrow of Iran’s democratically elected government. The idea that America sees itself as the good guy on the international stage leaves him bemused. Olivia Custodio’s “Driver’s license, please” had no characters that were of a specific ethnicity. She wanted to create a play where actors of any ethnicity could be cast. “So why not cast them all with actors of color and see what that brings to the table?” Rapier said. Raised in conservative Ohio by a Caucasian mother and Brazilian father, she came to Utah to study vocal performance at the University of Utah after two years in New York. Custodio started to acknowledge her own ethnicity nine years ago. When Rapier invited her to a private Facebook group for artists of color, she wasn’t sure if she counted. Attending the June 2017 meeting opened her eyes. She couldn’t speak to being a person of color, she felt, so she focused on feminism in her play. “I want [the audience] to take away that it’s the era of the women. It’s my time,” Custodio said. “I think if people really feel uncomfortable with my play, with the language, it’s fine. If it’s the violence — a woman taking control, a man getting his just desserts for being a pig — well, it’s a good catalyst for thought. I don’t think I’m alone. Stamp twice won a regional award on Showtime’s “Funniest Person in America” in the mid-1980s, a history that helped inspire “Roar,” an African-American family drama set within the stand-up comedy world. While stand-up was Stamp’s first foray into the spotlight, it was small-town theater in Kansas City, Mo., where he found his calling as an artist. He worked six part-time jobs to make ends meet, he said, including as a waiter and a guide at the local zoo. He appeared in “Driving Miss Daisy” and productions of Charles Dickens’ “A Christmas Carol” and “Joseph and the Amazing Technicolor Dreamcoat,” among others. Like the other playwrights, Stamp applauded Rapier’s drive to have the stage reflect the community. Stamp teaches English at Hunter High School in West Valley City and is grateful for the diversity he sees there, he said. When he saw the first rehearsal of “Roar” with his wife Melinda and daughter Sophia, he squeezed their hands and cried. “My play grew from an idea I had 10 years ago: our reawakening of social consciousness of how valuable women are,” he said. Alongside the tense, angry relationship between a washed-up comic and father and the adult daughter he had encouraged to follow in his comedic footsteps, Stamp also explores parallels between the economics of the Reagan era and life under Trump in a monologue by the father. “It occurred to me that what’s going on with [Trump’s government] is giving funding to the rich: It’s trickle-down economics,” he said. He feels the genre of comedy that he and Custodio mine in their plays provides a sense of connection in divisive times. Nationwide, of the plays produced in 147 regional theaters during the 2016-17 season, only 15.1 percent were by playwrights of color, according to a report called The Count 2.0. That was still an increase, up 4.9 percent from the first such study, published in 2015 by the Dramatists Guild of America and the Lilly Awards. Plan-B Theatre is in its fifth consecutive season of exceeding that percentage, said artistic director Jerry Rapier. The four plays in the “Of Color” series were written by playwrights of color; the casting challenges stereotypes about what roles actors of color can play; and Plan-B boasts an all-female design crew, he said. The March 28-April 7 run of “Of Color” at the Rose Wagner Performing Arts Center in Salt Lake City is sold out. Performances are scheduled Thursdays and Fridays at 8 p.m.; Saturdays at 4 p.m. and 8 p.m.; and Sundays at 2 p.m. But a prepaid waitlist will be started in the box office one hour before showtime; you must be there to get on the list. Then check back five minutes before showtime. As many waitlisters as possible will be seated; those who can’t be seated receive a full refund. General admission tickets are $22. — This coverage of downtown Salt Lake City arts groups is supported by a grant from The Blocks, a cultural initiative of Salt Lake City and Salt Lake County. The Salt Lake Tribune makes all editorial decisions.